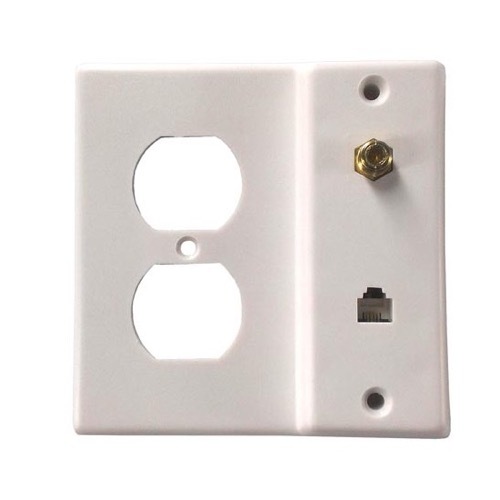 Allows connection of 75 ohm coaxial cable, phone line cord, and AC outlet through existing AC outlet brackets. Tools needed: wire cutter, wire stripper, Phillips-head screwdriver. The plate is 4 1/2" wide and 4 9/16" in height. Remove old wall plate from AC outlet. Run new or existing phone wires to new jack, remembering to match colors of wire to color coded terminals. Connect coaxial cable to back of plate. Replace wall jack to wall box, using screws enclosed.